Would you pay more for a netbook this stylish? A great, stylish, usable netbook, but it has a few weaknesses that we wouldn't expect at this price. Since Asus pioneered the humble netbook around three years ago, its Eee PC range has faced fierce competition from almost every other laptop manufacturer out there. From Packard Bell's Dot machines to MSI's Wind series, there's a mind-exploding variety of netbooks to choose from. Although most of these mini-machines appear identical on paper, there's actually considerable difference between many of the models. From the incredible battery life of the Acer Aspire One D260, to the solid build quality of the Dell Inspiron Mini 1018, every netbook we see has its own strengths and highlights. To make things even more confusing for the average consumer, there's also the huge resurgence of tablets to consider, offering a smart and convenient method for browsing the net and consuming media. 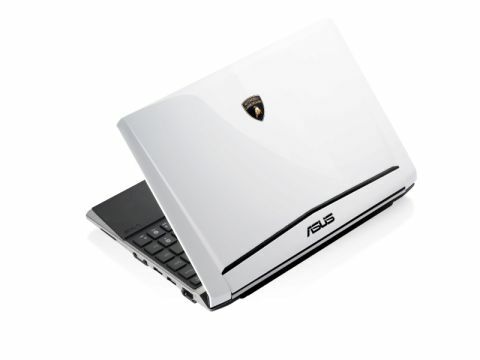 Into this saturated market bursts the Asus Eee PC Lamborghini VX6. Inspired by the Lamborghini Murcielago LP640 roadster, this is easily one of the most stylish netbooks we've seen. The curved lid mimics the roadster's drool-worthy chassis and comes in a choice of white or black. Lamborghini's famous crest is planted firmly in the centre and adds an extra touch of class to the Eee PC VX6. Pull back that lid and the black interior looks just as sharp. Asus has gone for rubberised palm rests, which feel good and add another distinctive touch that sets the Eee PC VX6 apart from its competitors. We were highly impressed by the Eee PC VX6's build quality, with no flex or weaknesses in any part of the chassis. The lid is incredibly solid and could probably brush off a firm knock without concern. This quality continues inside, with a firm and highly usable keyboard in place. Asus has stuck with the isolated-key design of its recent Eee PC models, such as the Eee PC 1015PE, and we found the board to be well-sized, filling the width of the chassis. There are gaps between each key to prevent mis-hits, but the gaps are covered to stop crumbs and muck from invading the Eee PC VX6's innards. It's rare to find an attractive touchpad, but the glossy finish to the Eee PC VX6's pad gives it a sleek chrome appearance that stands out and looks great. The touchpad is smooth and responsive, and a good size considering the netbook's compact chassis, with a firm single bar used for the two mouse buttons. The pay-off for the solid build is, of course, extra weight and bulk. While the 1.6kg weight isn't exactly going to drag you down, and the 38mm thick chassis can still slip with ease into most bags, the Eee PC VX6 is still heavier and chunkier than many of the netbooks we see. Unfortunately, it's also much pricier. With an RRP of £499, the Eee PC VX6 is almost double the price of the average netbook. The question is: is the extra cash worth it?